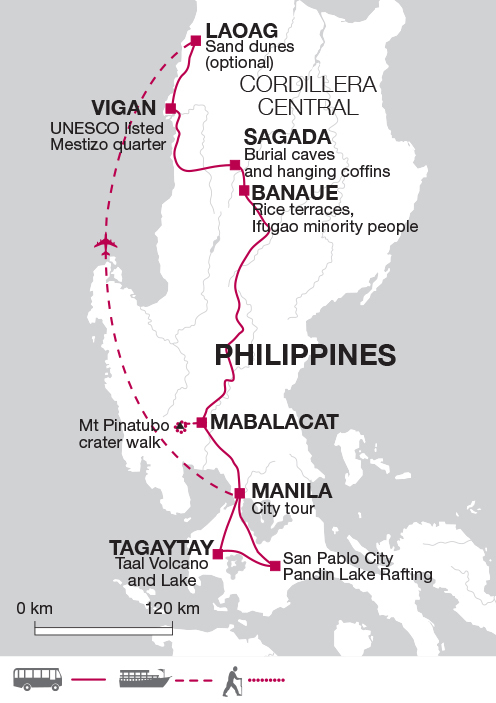 Our Philippines adventure focusses on Luzon, the largest island of the archipelago. We explore the whole island discovering contrasting landscapes which include the incredible 2000 year-old Banaue rice terraces of the indigenous Ifugao people within the central Cordillera Mountains; the sand dunes of Laoag in the north, and tranquil Pandin Lake surrounded by lush green coconut trees in the south. We have the opportunity to hike to the crater lake of Mount Pinatubo volcano as well as explore the teeming megacity of Manila and enjoy the charm of UNESCO-listed colonial Vigan by horse-drawn carriage. Located on the eastern shores of Manila Bay, Manila lies at the heart of Spanish activity in the Far East during the 16th century. Once known as the 'Pearl of the Orient', the city went on to witness several Chinese insurrections, a British occupation and a Sepoy mutiny, a war against the Spanish and the Americans and some of the most bitter fighting of World War II. Today it is the capital of the Philippines and one of the most populous cities in the world. This morning we take a tour of the city by bus visiting Rizal Park and the historic walled city of Intramuros, where we find San Agustin, the oldest church in the Philippines and a UNESCO World Heritage site. In nearby Binondo, one of the first Chinatowns in the world, we explore the network of alleys and side streets that lead us to Binondo Church, Santa Cruz Church and the old commercial district of Escolta where we'll see art deco structures, such as the Perez-Semanilio building, that survived World War II. The afternoon is free. The bus will return to the hotel, however you may wish to stay in Chinatown for lunch and further exploration of this colourful area, visiting one of the Taoist temples or mingling with the locals in the street markets, returning independently by taxi. We depart Manila this morning and head south to San Pablo City in Laguna Province, where we find ourselves amongst tropical foliage and coconut trees, scenery typical to this rural part of the Philippines. We board a large bamboo raft on Pandin Lake where we gently float across the lake. Those wishing to swim are welcome to take a dip. We enjoy an included lunch in traditional Filipino style - using our hands to eat food served on a banana leaf. Afterward we drive on to Tagaytay for an overnight stay. This morning we drive to nearby Taal Volcano, one of the smallest in the world. The volcano itself is located on Taal Crater Island within a lake, a caldera formed by prehistoric eruptions, and is still active. We enjoy a boat trip across the lake to the island, where we trek up to the crater to be rewarded with beautiful panoramic views of the caldera lake. You may wish to treat yourself to a fresh coconut drink as you enjoy the scenery. We make our way back to the mainland where we will stop for a lunch break before driving back to Manila for our late afternoon flight north to Laoag. Total walking time is around three hours with a climb of 300 m.
We have a full free day to enjoy the many activities available nearby. Optional activities include an excursion to Paoay Lake and the Baroque 18th century UNESCO Paoay Church, otherwise known as the Church of Saint Augustine - famous for its unusual architecture and bell tower built with coral stones; a Walk across the coastal La Paz sand dunes or an excursion to the tropical palm fringed sandy beaches of Pagudpud on the northern coast of Luzon, around an hour and half from Laoag. We spend the morning driving south to the charming town of Vigan. One of the few Hispanic towns left in the Philippines. Vigan's historic heart was inscribed on the UNESCO World Heritage list in 1999. The best-preserved example of a Spanish colonial town in Asia, it is home to cobbled streets, colonial villas and the imposing grandeur of a 16th century cathedral. This afternoon is free for you to relax or head out and get a feel of the city ahead of our full day's sightseeing tomorrow. This morning we discover Vigan by kalesa (horse-drawn carriage). We see well-preserved old stone houses made from hard adobe stones such as the Syquia Mansion, a former presidential residence. We also visit the Burgos museum, a small ethnographic museum. Later we take a short drive to a pottery workshop known locally as Burnayan, where we learn about the ancient tradition of pottery making, dating from the 16th century. Here we can also browse shops that showcase hand woven fabrics and antiques. We head back to the city and on to Calle Don Mena Crisologo where we sample famous Ilocano delicacies such as the longaniza (sausage), empanada (meat pie) and bagnet (deep fried crispy pork crackling). After an early breakfast, we drive to Sagada, arriving in the early afternoon. We visit nearby Echo Valley to see the mysterious hanging coffins and Lumiang cave, a burial cave. The indigenous population have been burying their dead in coffins perched high on cliff faces for over 2000 years. No one knows exactly why this practice started but it is believed to both keep the preserved bodies safe from wild animals and take them one step closer to heaven. We make our way this morning to Bontoc, a bustling market town and former capital of the Cordillera region. We will visit its small museum that has a number of interesting exhibits about the region's indigenous communities. We continue on to Banaue (1300 m). Carved into the mountains of Ifugao province, the 2000-year old rice terraces that occupy these high, fertile landscapes are considered by Filipinos to be the Eighth Wonder of the World. Our destination is the town of Banaue, our gateway into the remote villages of the Cordilleras. The Banaue Rice Terraces and recognised as a National Culture Treasure along with the rice terraces that are found in Mayoyao, Batad, Bangaan, Kiangan and Hungduan. It is believed that if these ancient terraces were laid end to end they would reach halfway around the planet! This afternoon we take a local jeepney (a converted jeep/bus) and drive out towards drive out towards Hapao village. As we drive through the mountains we enjoy some spectacular views of the Cordilleras as we pass through a series of deep gorges and canyons to the Hapao Rice Terraces where we are rewarded with spectacular scenery of terraced rice fields cut through by the clear waters of the Hapao River. Total walking time is around two hours. This morning, we ride a jeepney to Sadel, the starting point of our trek to the Batad and Banga-an rice terraces. The trek takes us along the terraces and up to a viewpoint that overlooks the terraces. From here the view is almost completely panoramic and some describe it as like looking down onto an ancient amphitheatre. Today sees an early start for a full day drive to Mabalacat, our base for climbing Mount Pinatubo tomorrow morning. Located in the mountains that separate the central plains from the west coast of Luzon Island, Mount Pinotubo volcano was the scene of the second largest terrestrial eruption of the 20th century when, on June 15, 1991, it erupted with an intensity that was ten times that of the Mount St Helens volcano, a decade earlier. On arrival in Mabalacat later on today we have the opportunity to rest in tranquil rural surroundings. This morning we leave quite early for the drive to the Santa Juliana station, where we take 4x4 jeepneys to drive to the foot of the trail head , from where we trek to the volcano's crater - a relatively easy walk of usually around two hours each way, although in the months of March to May when there may be some erosion of the path due to rainfall, the roads are manually paved to allow access, making the jeepney drive longer and the trek shorter. After a lunch break we return by road to Manila for our final night. Total walking time is around four hours. Please note that there are several stream crossings in ankle-deep water on this trek, so please be prepared for your footwear to get wet. Seasonal weather patterns can be unpredictable. For up-to-date information on the weather worldwide please visit www.bbc.co.uk/weather. The central and northern islands of the Philippines have a tropical monsoon type of climate with a single season of heavy rain. In most areas the wettest time is from July to October with rainfall being particularly heavy in the period August to October, when much of it comes from tropical typhoons in the South China Sea. Temperatures remain fairly high throughout the year (late 20's Celsius) except in the mountains which will be cooler. The region is tropical (humid) and days can be very hot although evenings in the Cordillera mountains will be cooler. Casual, loose fitting clothes are the most practical. We recommend shorts, lightweight trousers and skirts, lightweight shirts and T-shirts. An umbrella is excellent in sticky, tropical conditions and a sunhat is essential. Comfortable walking shoes for the Mount Pinatubo and Banaue rice terrace walks. Trainers and/or sandals for other sightseeing. Binoculars, torch, water bottle, insect repellent, high factor suncream (at least factor 15), good quality sunglasses and a lip salve with sun protection. Accordingly, you should allow US$40. If you\ re leaving the country from Cebu Mactan airport you must pay a departure tax of 750 pesos in local currency or the equivalent in US dollars. From 1 February, there's no longer a departure tax at Manila airport. Philippines: Citizens of the UK, EU, Australia, US and Canada may enter for 21 days without a visa. However, you will need to provide a valid flight ticket to show that your return journey is within this time. All passports must have at least 6 months validity remaining on exit from the Philippines. Other nationalities should consult their local embassy or consular office. Nothing compulsory, we recommend protection against typhoid, tetanus, diphtheria, polio and hepatitis A. Consult your travel clinic for latest advice on Malaria and Zika Virus. Please take preventative measures to avoid mosquito bites - these include mosquito repellent as well as long trousers and long sleeve shirts to cover up when necessary. Although not compulsory travellers may also wish to immunise themselves against Japanese encephalitis. Please check the latest requirements with your travel clinic or doctor prior to departure. The above is not an exhaustive list. Further information regarding vaccinations and travel health advice can be found by following the NHS and NaTHNaC links at Explore Travel Health and from your local healthcare provider. Visa and vaccination requirements are subject to change and should be confirmed by you before travelling. The Philippines have been listed in the Top Ten destinations to travel to by the Lonely Planet in 2015 and we believe this trip showcases the diversity of the landscape and culture of the island of Luzon. This trip is ideal for reasonably fit and adventurous travellers as there are a few early starts and some long days on the road as well as plenty of activity - including a volcano climb and walking amongst rice terraces. All in all this holiday is an unforgettable trip to one of the less visited South East Asian destinations.